Last August, Google expanded the character limits within their text ads in SA360, ahead of the Responsive Search Ads launch tipped to launch in autumn this year. In true NMPi fashion, we’ve been testing the effect of the increased SERP real estate on campaign performance. The extra character limits are designed to give you more room to convey your message to the user. It allows you to add a third headline, a second description, and use up to 90 characters for each description. Ultimately, giving you much more control over your messaging. With these larger ads you’re able to take up more space on the SERP, meaning that the top spot is even more lucrative. Note that sometimes your ads might be cut short if there isn’t enough space. So, make sure your copy still works without the third headline or second description. The most obvious thing you can do with the extra characters is include more detail. You have more space to provide more information about your product or service. It’s easier to call out any offers or deals, or your USP. With all of this additional information, users are more likely to click on your ads. It also gives you another opportunity to test your messaging within your ads. There are greater variations which you can compare to discover which resonates best with your audience. Google claims that these longer ads receive 15% more clicks than other formats, so we decided to test it for ourselves. We ran a preliminary test between the standard text format and the new expanded format. By the end of the test, we could clearly see the difference in performance. 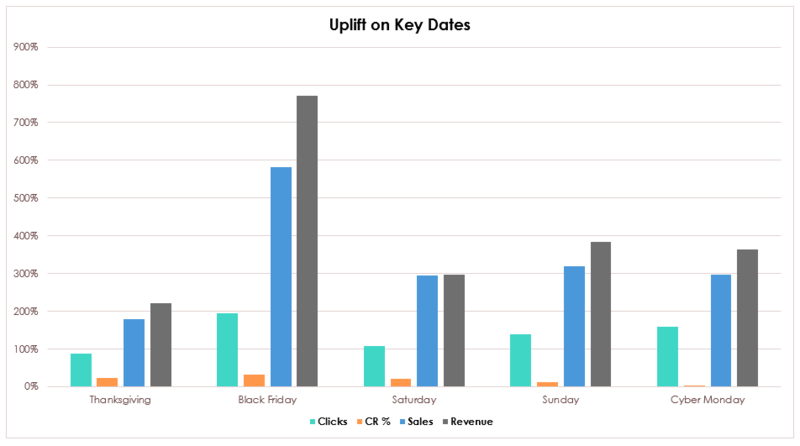 Impressions for the expanded format were significantly higher, matched by higher clicks. In fact, we also saw a 10% uplift in CTR. The campaign did see a lower conversion rate, however, this may be attributed to the 30-day cookie window and the short period in which the expanded format has been available to test. It is easy to see how effective the expanded text ads are: more impressions, more clicks, and higher click-through-rate. We highly recommend taking advantage of the extended character limits and testing their performance for yourself but do keep an eye on your conversion rates. 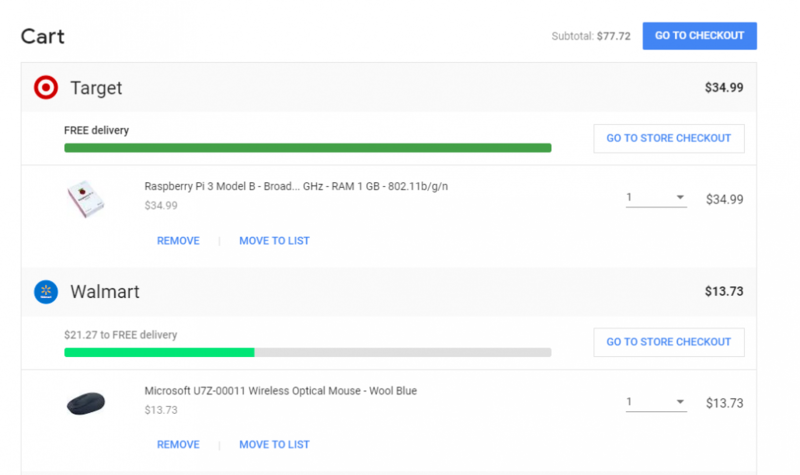 Google Express – The Neutral Marketplace? Google Express has been around for a while in the US, but it has enjoyed a recent rise to prominence after removing its subscription fees to become a completely free service, as well as expanding the number of stores it partners with on its marketplace. As a response to Amazon’s overwhelming dominance as a hub for online shopping, Google Express offers users the opportunity to shop local groceries, gadgets, and luxuries, all from one site. At first glance, Google Express sounds identical to Amazon, but there is one striking difference. Where Amazon houses its vast stock in warehouses, Google Express delivers products directly from local retailers. This leads to a particular constraint on their marketplace, since you can only order from specified stores and must reach a minimum spend per-store to receive free shipping ($25 or $35 for most stores). However, looking at the retail giants like Target and Walmart, who have signed up for Google Express, this new venture is becoming a real contender. What does Google Express aim to achieve? The reason these heavyweights are being attracted to Google Express is that Google has positioned itself as a neutral marketplace, not competing against third-party retailers. In other words, Google doesn’t own any of the products it is selling, as Amazon does, so the success of third-party retailers is its main focus. They aim to promote and nurture customer loyalty, providing great customer experience and helping to expand the retailers’ digital touchpoints. Ultimately, this will save retailers time and allow them to focus on other channels. Google Express brings a whole new service offering into Google’s already immense eCommerce portfolio. By showcasing a vast number of products from a variety of stores on one marketplace, Google has developed a powerful platform to further synergise its online AdWords solution with its offline logistics solution. Below is an example of a Google Shopping PLA, where the listed merchant is, you guessed it, Google Express. This ad takes you through to the Google Express marketplace where you are able to complete your purchase, entirely through Google services. Expect this to be an increasingly frequent occurrence as Google inevitably ramps up its all-encompassing collective shopping service. 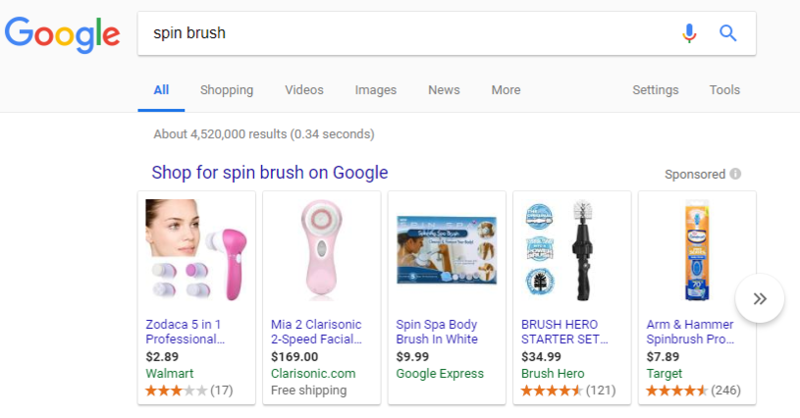 Not only do we expect Google Express to dominate in Google Shopping results, but it also allows users to search, browse and purchase products through their voice search feature, Google Assistant. Though Amazon’s Alexa can also be used to browse and order products on the Amazon marketplace, all through voice, this requires an Alexa-enabled device and Prime membership. Google Assistant, on the other hand, is a free to use voice service and is compatible with multiple devices, including smartphones as well as Google Home. We can expect to see voice-purchasing rising to new heights in the near future. With Amazon already dominating around half of all eCommerce transactions, Google Express will have a real battle on its hands. It’s unlikely that they, or anyone for that matter, will be able to trump Amazon’s delivery service, especially with two-hour delivery available for Prime members. When time and convenience are an increasingly important factor for consumers, this is a big tick in Amazon’s box. As we’ve already seen, Google Express is positioning itself as a neutral marketplace, available to all, with no membership fees. This has a certain appeal, but will consumers really shift their purchasing behaviour when they are so used to visiting the merchant’s website? This is why so much hope for Google Express comes from their belief that voice-driven search and shopping will take off dramatically in the near future. Google is thoroughly engrained in the lives of many online users, from Gmail to Google Search. This makes them well placed to take over online shopping. But ultimately, when you’re able to shop everything (including fresh fruit & veg) from one site – Amazon – and in one basket, to be delivered at a time most convenient to you, who would choose otherwise? What does the future hold with Google Express? As Google expands its powerful array of products and services, expect these to become increasingly integrated with each other. With some of the biggest retailers flocking to Google Express, this could well become an eCommerce platform to rival Amazon, particularly with the rise of voice search. As digital marketers, we need to consider how Google Express could change the advertising landscape. For instance, it is already present in Google Shopping results, showcasing some of their leading brands. As these eCommerce giants develop their new initiatives, we should prepare for a game-changing phenomenon and Google Express could be the one to watch. Whilst, it is currently only available in the US and there is no international shipping available keep an eye on this space. Google has not announced any future plans to expand but if the service is successful it undoubtedly will look towards Canada, the UK and Europe. Today, we are delighted to announce that NMPi and our sister company, DQ&A, have agreed to acquire a fantastic international digital creative specialist, called Joystick. Established in 2006, and now with a team of over 90 digital creative experts in New York, Los Angeles, London, Santo Domingo, and the Philippines, Joystick is a market leading creative specialist with extensive expertise in data-driven dynamic ad technologies, and is one of only two DoubleClick Certified Creative Partners in both the UK and the US. Joystick works with some really incredible and exciting brands including, Disney, Nissan, HBO, and Kroger. In a recent project for Google, Joystick created a dynamic ad which had over 60,000 different creative variations and was localised for an impressive 22 markets and 7 languages. We are looking forward to joining forces with a company who shares our belief that the perfect blend of technology, data and artistry makes every execution smarter, more dynamic and more effective. 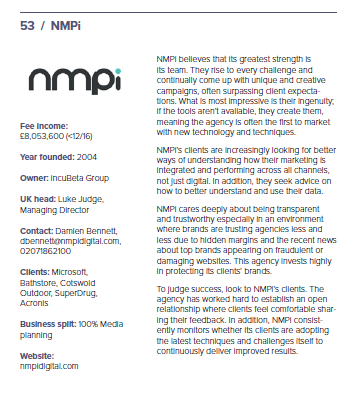 With this acquisition, NMPi is now able to directly offer our clients targeted campaign solutions including, Dynamic Ads, Programmatic Creative, and Rich Media Display Ads, as well as tailored digital experiences with Responsive Website Development, Experiential Apps and Campaign Landing Pages. With over 18 years experience in digital marketing, Sara is a seasoned executive with extensive knowledge in management, client strategy and business development. For the first part of her career, Sara focused primarily on the entertainment vertical working for such companies as Miramax, Deep Focus and Moxie Interactive. In 2010 Sara joined Joystick to lead the Los Angeles office and account management team company-wide before being elevated to CEO. Our sister company, DQ&A, is Google DoubleClick’s largest EMEA partner in the technology and professional services field. When combined with Joystick’s DoubleClick Creative Partner status, the acquisition forms a strengthened DoubleClick relationship, further solidifying its strategic offering and authenticity within the digital industry. This news follows our 2017 global expansion into 6 new markets, including 2 offices in the US, as well as our recent acquisition of U.S boutique Paid Social specialists, MediaPact. With DQ&A also launching in South-East Asia, Australia, Africa and Italy, this only serves to strengthen the marketing group’s international presence and localised expertise. As a group, we are now able to boast a global presence of 340 people across 16 offices. The acquisition is subject to standard completion procedures and is expected to complete within the month. If you would like to receive any further information, do not hesitate to get in touch. We are excited to announce our acquisition of boutique paid social specialists, MediaPact. Following a year of international expansion in 2017, this kicks off another year of continued growth. Last year, we opened 2 offices in the US, and this will further our growth in the Paid Social market: allowing us to grow our presence in the US market, providing benefits not just to our US clients but those across the globe. MediaPact is based in Los Angeles, California, offering paid social advertising on a performance model and working with clients such as Fabletics, JustFab and Nicequest. With their specific expertise and our international footprint, it’s a match made in heaven that will further develop our Paid Social offering. Paid Social has been an integral part of our proposition for a number of years, and this expansion of our knowledge couldn’t come at a better time. MediaPact’s American influence will help support our continued growth in the US market, and will also allow our clients to gain earlier access to Facebook and Instagram betas that are launched overseas first. “MediaPact’s knowledge will help amplify our expertise and reach for a service that is growing exponentially within our business,” says Judge. This acquisition demonstrates that we have no plans to slow down after 2017’s successes and that we at NMPi will continue to grow, both in terms of our services and our international activity. With only 3 months left until GDPR becomes a reality, we joined The Drum to find out how industry leaders are preparing for the new legislation. It’s an update of the previous Data Privacy Directive, and much of this is still at the core of the regulations. However, we’re looking at a very different landscape to the one of 1995, and so GDPR takes the age of the internet into its remit. The right to be forgotten, privacy by design, increased territorial scope; all of these new regulations are part of the maturity of the internet. Hence, many envision GDPR compliance as a natural reordering of the system, one which will see evolutionary rather than revolutionary change. GDPR in and of itself is a behavioural change. It’s an attitude adjustment. Managing consumer privacy will be a huge part of many a marketer’s focus, as well as a full awareness of the journey and uses of consumer data. The most fundamental aspect is putting user privacy at the very core of all of your technological platforms. You will have to ensure that you have a technical team to help you with the technical solutions to what is a technical challenge. Don’t trust that the consumer always knows when their data is being collected, or how it will be used. Sometimes, they might be sharing this data by mistake. Education is going to be a big part of any business’s GDPR adoption, as well as placing incentives for the consumer on data sharing. However, be aware that educating the consumer will also raise consumer awareness of the past uses of their data. Don’t underestimate the power of the activist consumer in this space: in the past, advertising has gone too far into the dark pits of sketchy data usage, with B2B being one of the darkest areas. There is potential for this to explode after May: the wrong consumer being retargeted in the wrong way could lead to a high profile court case. What’s very clear is that, while everyone’s focus is on making their business GDPR compliant, no one is thinking about what will happen after May. Some have concerns that we don’t know what the level of consumer consent will be when consumers are more likely to have to opt-in to having their data recorded, as opposed to merely consenting by default. If they are given the time to think, it is plausible that they may be more likely to opt out. We also don’t know how the back ends of websites or email servers will keep up with these changes. However, there could be a lot of good news. The first thing is that it will force marketers to do a better job. Instead of relying on first party data to optimise towards people who would likely have bought anyway, marketers will be forced to create better quality content to influence consumers. On top of this, we should see a better relationship between the agency and their clients, and more respect for the consumer and their privacy. We’re also already seeing a lot of collaboration between competitors, because if one of them does a lackluster job everyone in the industry will suffer. Respect will shape our relationships across businesses and with consumers in a much more positive way. Brace yourself for a new industry where respect, quality and privacy are paramount. However, it appears retailers had nothing to worry about as Black Friday sales were expected to reach almost £8bn during Cyber Weekend (BBC), an increase of nearly 38% over the record-breaking £5.8bn in 2016 (The Economist). What is interesting this year is that for the first time Sofa Sunday actually outperformed Cyber Monday, though not by much. The difference between device performance in 2017 and 2016 is staggering. In just a year mobile devices have made a massive jump to overtake desktop in driving website traffic. Whilst mobile is growing; desktop is still the leader when it comes to conversion rate. The bigger screen and ease of checkout keeps the user engaged from research to purchase. 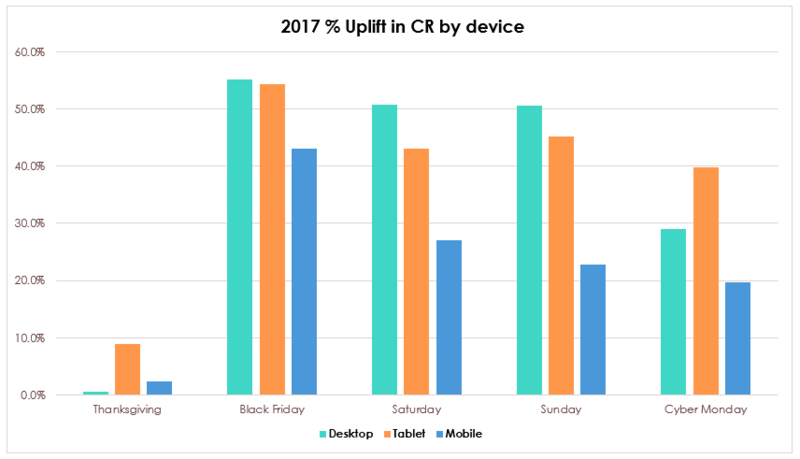 From the chart above we can see that our US clients saw significant uplift from their digital activity on Cyber Monday, which is a stark contrast to the UK and Europe. This is not unexpected and is due to the Thanksgiving holiday period. 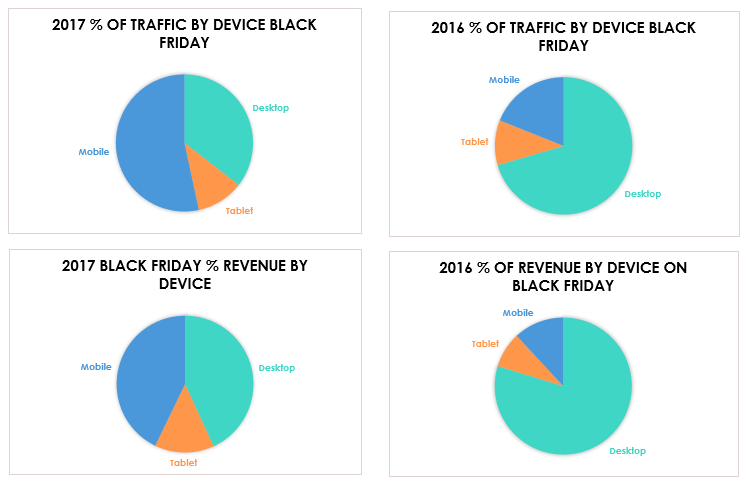 Since Americans have Black Friday off most of their shopping occurs in-store rather than online. With 19 days till Christmas, the gifting season isn’t over yet. There are still three big shopping weekends to come. As we get closer to Christmas you can make several adjustments to your ad copy: use countdown clocks to emphasise the last day for shipping before Christmas, and then switching campaigns to click and collect messaging once that date has passed. Keep an eye on your stock levels. Make sure you are not pushing ads for items you no longer have. This is a sure fire way to lose customers. And most importantly keep your customers engaged. The Christmas shopping period is getting longer and longer, and consumers are now oversaturated with marketing messages, so you need to be different. Change your messaging to prevent creative fatigue and keep consumers engaged with your brand through the whole period. Today, we are really excited to announce the addition of two new offices to NMPi. Over the past year, we have launched our brand in 8 new markets, including, Australia, Malaysia, the Netherlands, Singapore, Switzerland, South Africa, and now New York and Los Angeles in the US! With the growth of our global network, we are proud to now boast 24-hour global support for their clients. “NMPi offices now cover every timezone around the world, giving our clients access to staff 24-hours a day. It’s really exciting for us to be able to offer this level of service. Their customers aren’t just shopping 9 to 5 on weekdays, so we want to have them covered no matter what,” says Judge. The launch of our US offices follows a significant client win. In September this year, we began delivering Paid Search, Display, Paid Social and Analytics services for US retail group, Fullbeauty Brands, and seven of their subsidiary companies. Fullbeauty Brands has specialised in plus-size clothing for women and men in the US for over 100 years and includes the popular brands Jessica London, ellos, Woman Within, and King Size. In July this year, we announced a strategic partnership with global technology company, Pitney Bowes. We are helping them strengthen their industry-leading global e-commerce offering with enhanced consumer marketing solutions, including international paid-search campaigns, display advertising, social media advertising and fully optimised Google shopping experiences. We are thrilled to announce that for another year running, NMPi has made the list. With a 15% YoY increase in UK fee income, we swooped in and secured the fifty-third spot. This is a massive triumph as we appear next to some of the world’s leading advertising agencies. If you would like to see the full report visit Econsultancy: Top 100 Digital Agencies 2017. Join us on Wednesday, the 30th of August, 2017, at 12:00 pm (GMT) for our webinar on tackling your Christmas campaigns this holiday season. While it may still be summer, it’s important to get the jump on planning your Christmas strategies so that you’re not left in a lurch by the time holiday advertising gets into full swing. Our webinar will help you get ready for the busiest time of the year. Make sure to register, and get the jump on the competition and ensure a successful holiday season. We are excited to announce today that NMPi has entered into a strategic business relationship with global technology company, Pitney Bowes Inc. NMPi is helping Pitney Bowes strengthen its industry-leading global e-commerce offering with our enhanced consumer marketing solutions, including international paid-search campaigns, display advertising, social media advertising and fully optimised Google shopping experiences. Optimising digital marketing campaigns for 220 different countries and territories can be challenging for retailers looking to grow revenue through cross-border e-commerce. Pitney Bowes and NMPi have worked with clients around the globe and in a wide range of industries including fashion, retail, finance, and travel to elevate their digital advertising capabilities to better reach and engage with consumers. Pitney Bowes’ Complete™ Cross-Border offering is the industry’s most proven, capable and scalable end-to-end global e-commerce solution that can handle all facets of enterprise retail cross-border expansion. With the addition of NMPi’s innovative technology and talented team of digital analysts, Pitney Bowes will be able to offer its cross-border clients best-in-class digital marketing solutions, as well. “In today’s competitive global environment, retailers need every measure of help they can get in driving top-line growth and running their day-to-day operations. Cross-border revenue streams driven by effective digital marketing solutions can help alleviate some of that pressure, but it is often difficult to put the right people and processes in place to get that started. Our relationship with Pitney Bowes makes all of that easier for retailers. With Pitney Bowes, we will offer retailers scalable, global digital marketing solutions that meet consumers where they are and guide them to a superior global e-commerce experience,” said Luke Judge, CEO of NMPi.